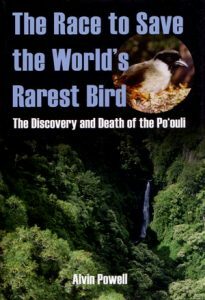 The race to save the world’s rarest bird: the discovery and death of the Po’ouli. WAS $55. Thirty years ago researchers discovered a previously unknown species of bird in the rain-soaked and remote mountains of Hawai’i. As they studied the bird – which sported a black mask and was called the Po’ouli – they soon learned that its population was shrinking quickly, and they worked frantically to find out what was killing the species and how they might prevent its extinction. This fast-paced account of their work, done in one of the world’s most inhospitable environments, describes a stirring fight for survival. It also illustrates the challenge of protecting endangered species in a rapidly changing world.